PCDaily hasn’t visited Nova Scotia’s Kate Church for two years and when she appeared on the DailyArtMuse, it was time to look again. 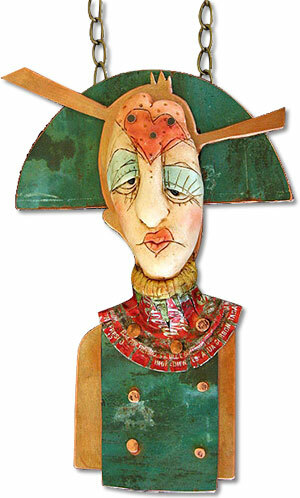 Kate’s mixed media jewelry, like this polymer-faced Red Queen, resides in theatre boxes when they’re not being worn. Her droll dolls and puppets may frown but they dance joyously. They have, as one show was entitled, A Certain Mentalitea that you can experience here. If your art could use better online exposure, check out DailyArtMuse’s Artist Online classes. OOOOOOH, this work! Checking her site right now to see where she is teaching. So drawn in by her work, would love to just hear her talk about it. Oh, wow! Really amazing work. ohhh…….love, love, love, her work. Thanks for this link for sure. What a wonderful way to start my day! I just finished scrolling through Kate’s blog and adding her to my Google RSS feed. Thank you for re-visiting her! wow, her art is so cool!! She was just here in Texas last weekend for a 3 day workshop at the North Texas Guild–as you may imagine, they were full up! She seems like an incredible teacher. Kate indeed taught one of the best workshops I’ve ever taken. She is a sweet gentle spirit with the patience of a saint! We’re definitely having her back to teach us some more. She taught how to mold faces and how to change them up – an easy way to make hands and pose them any way you want as well as graceful ballerina feet. Then she showed us how to draw out a pattern and make clothes. It was a packed workshop and every single person absolutely loved everything about it. Have her come teach – you will be glad you did! Love, love love Kate’s work. Thanks to Susan Berkowitz Kate gave a wonderful workshop here in San Diego. Thank you for featuring one of my very favorite polymer artists! 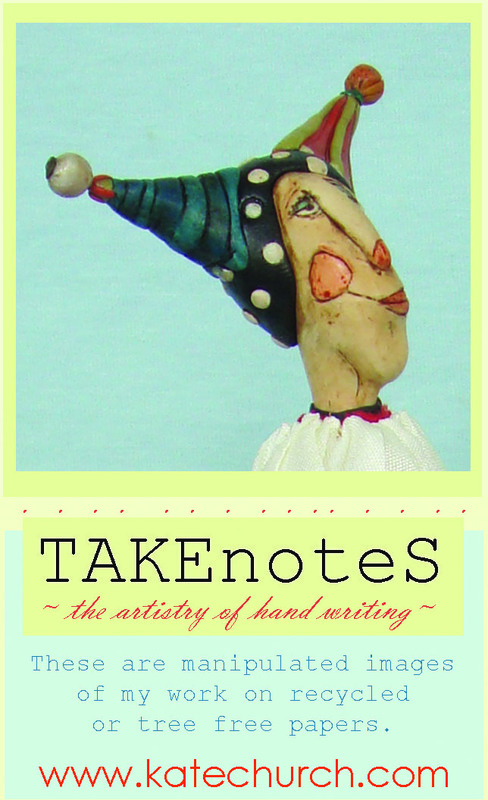 I had not seen her work in awhile and happily signed up to follow her new blog. I would so love to attend one of her workshops. Kate Church’s work is out of this world i wish I could be like her. I admired Kate’s dolls there are unique!!!!!!!!!!!!!!!!!!!!!!! I may have missed this the first time around or forgotten about it over time. I recently took a 3 day workshop with Kate Church. What a lovely creature she is! I may have missed this the first time around or forgotten about it over time. I recently took a 3 day workshop with Kate Church. What a lovely creature she is! I know that she plans on cutting back on teaching so….if you want to get in on one do it soon!